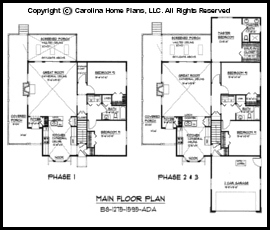 From the Build-in-Stages series this flexible house plan for small budgets adapt to your building needs as your family or budget grows. 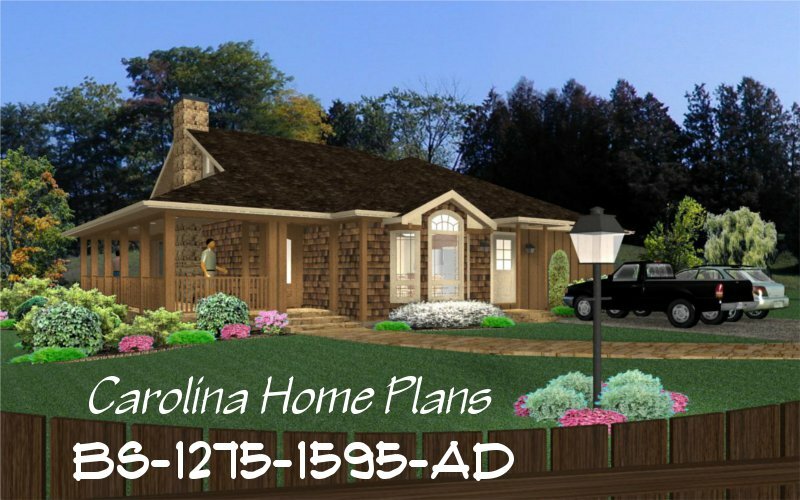 Starting with the basic 2 bedroom, 1 bath layout (expanding to 3 bdrms, 2 baths), this stunning small expandable home features stylish beam-work combined with floor to ceiling stone fireplace adding visual height and drama to the cathedral Great Room. 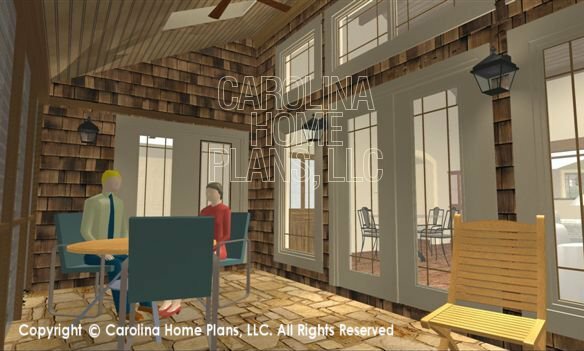 Enjoy summer entertaining with easy access to a wrap-around porch and vaulted screened porch. The large, fully equipped kitchen includes a lunch counter open to the Great Room as well as a cozy breakfast nook. 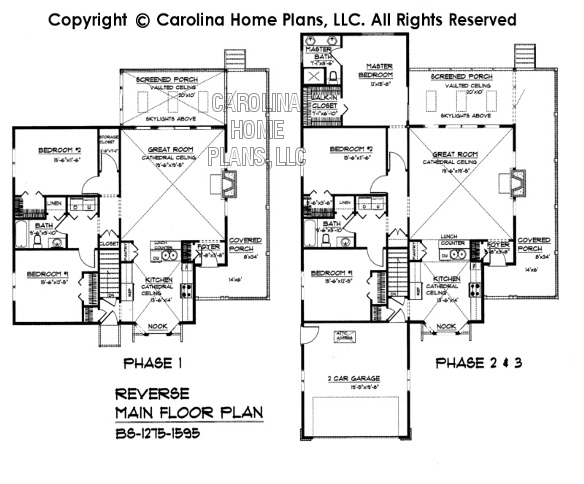 Designed for maximum ease when adding on a Garage and Master Suite this adaptable plan is indispensable for growing families and tight budgets. 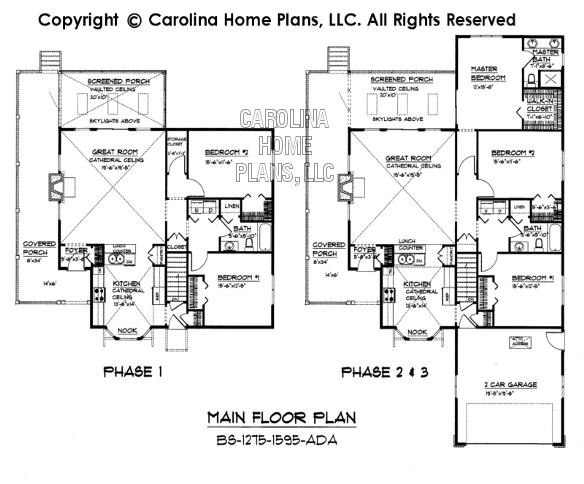 Please note: These plans are specifically geared toward building in phases and contain extra construction sheets. Available options and pricing: See below. This young couple had the land, the desire and need to build (their first born was on the way) but not a lot of money. Our solution for them was to design a small expandable house plan for a small budget which would offer the flexibility of serving their immediate needs now but was easily expandable for their growing family and budget. Building in stages was especially appealing since they could add on in phases as their needs required and their budget would allow, adapting to their time frame. We planned all future construction ahead of time making provisions on the building plans so that future work would not be disruptive to them while living in the home. They even planned on doing some of the work themselves.